What to Wear to Baby’s First Birthday?- A child’s birthday, especially the first one is a momentous occasion. It’s more a celebration of the parents for making it so far than it is for the baby. Social events like these are important especially when the baby’s parents are your best friends or family. You want to make sure to be as involved as you can be in their happiness and to do that YOU HAVE TO DRESS RIGHT! But how? For someone who has never attended a child’s birthday before, choosing the right outfit can be quite a challenge. What colors to wear? What style? If only you had a fairy godmother who could help you… and that’s where we come in. Here to help you dress the right way to a baby’s birthday party, we have compiled outfits inspirations to help you. WHAT TO WEAR TO A KID’S FIRST BIRTHDAY PARTY? Kids birthday parties are a more ‘hands-on’ affair. There are activities involved and most of the time, participation is compulsory. Getting the right amount of comfy meets chic is crucial. Checking all or most of these styles will make you the life of the party. When it’s your baby girl’s first birthday, nothing can be more easier and yet more beautiful than a floral theme. And you can simply look amazing in a floral printed dress. Also have a look at these 22 Cute Floral Print Outfits Combinations for Spring Season. The beautiful sadie dress below can be bought here for just $ 89. Blogger Brett Firdman recently did an amazing birthday party for a little one that was California Dreamin themed and she pulled it off with great success so do check it out. Also have a look at these 20 Ideas What To Wear For House Party. ↓ 18 – What Should Mommy Wear on Baby’s First Birthday? Wearing bright colors doesn’t only make you stand out in a crowd but it affects your general aura and those around you. Wearing bright colors makes you look playful which is all you need to be at a kid’s party. Don’t be afraid to bring out the kid in you. Go all out with colors. If you can’t decide which one color to go with, go rainbow!!! Even a colorful bag does the trick. Sure, heels are a go to for many women but they are quite uncomfortable especially at a party where you will probably be running around little munchkins. Sneakers, flats or sandals should be your footwear of choice. It’s not only comfortable but stylish especially at a summer’ day. Who says you can’t wear sneakers with a dress? Or if you’re feeling really casual. Eastern style sandals or ‘Khussas’ are really in these days and they look good with dresses too. With kids of all ages around who knows who might spill what on you. Avoid wearing something expensive, better to be safe than sorry. And remember with the right styling no one can tell if you’re dressed in thousands or hundreds. Keep it simple. Here are 14 Minimalist Outfits For Summer & Minimal Fashion Style Tips. Don’t let anyone tell you that a preppy sweater and jeans don’t look good. A comfy, flowy top is always a good idea. ↓ 9 – What Not to Wear? In summers mostly, one tends to opt for lighter hues, But again, the risk of spilling something is too high. It’s best to avoid white, try patterns instead. And if you’re really in the mood to go light, wear pastels. Can’t go wrong with pastels. Sometimes a tiger skirt is all you need. Channel your inner Duchess of Cambridge with this pastel pink. Plaid isn’t for lumberjacks anymore. And striped outfit can simply never go out of style so opt for them if you want a minimalist statement making outfit. Check out these 10 Ways to Wear Striped Shirts. Kids parties are family events and dressing more conservatively goes a long way. A cute button-down shirt or crewneck sweater looks clean and polished. Either go for a half-sleeved shirt with a long floral long skirt or a simple jeans and shirt. Both of these looks ar ideal. But if you’re feeling playful, than a school-girl skirt and baggy sweater are just as cool. Like I said earlier, a kid’s party can be quite eventful, you want to make sure your outfit gives you the liberty to run around with feeling the need to be conscious about your dress. What’s one piece of clothing that is the epitome of comfort and still stylish. DENIM OF COURSE! 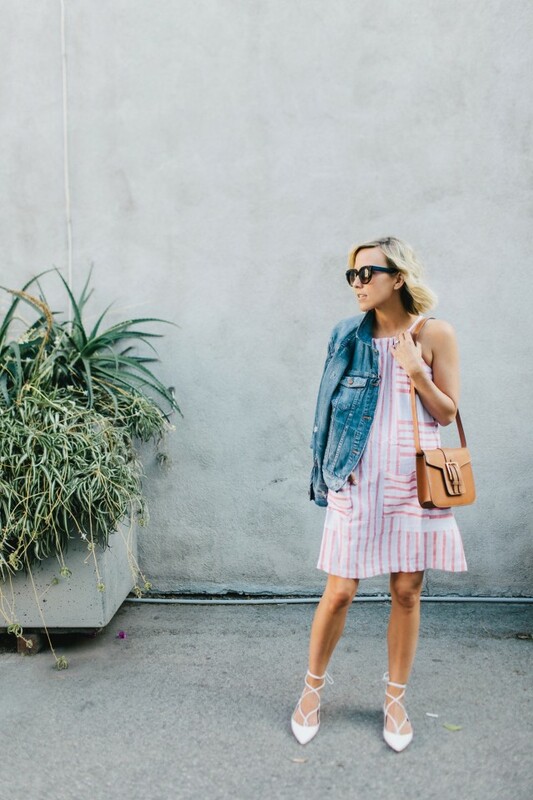 Now denim isn’t only restricted to just jeans, if occasion calls for it, denim jackets on a summer dress are a great look for a birthday party. It’s the right amount of retro and modern. Bring the 8O’s back with this look. When life gives you lemons, stick them on a skirt and slay. At the beginning of this post we said to wear colors and we stand by it. But life is full of contradictions and so is this post. There are days when you just feel like wearing one color and it’s totally okay to. Sure mixing different colors is great and all but sometimes, just one color says it all. Here are a few ideas to perfectly pull off monochromatic looks. Attend a kids party with a Burberry photoshoot in mind. Every girl needs a little black dress and you can never go wrong with it. …or a little navy dress. Remember, every party has a different aesthetic and dressing accordingly is respectful. It presents you as someone who sticks to the theme and helps develop a better sense of fashion. Everyone has their own sense of style, ideas presented in this article are merely for consideration. Take ideas from these and check what works for you based on what kind of party you’re going to. Play around with different styles and NEVER restrict yourself to a certain style or color.